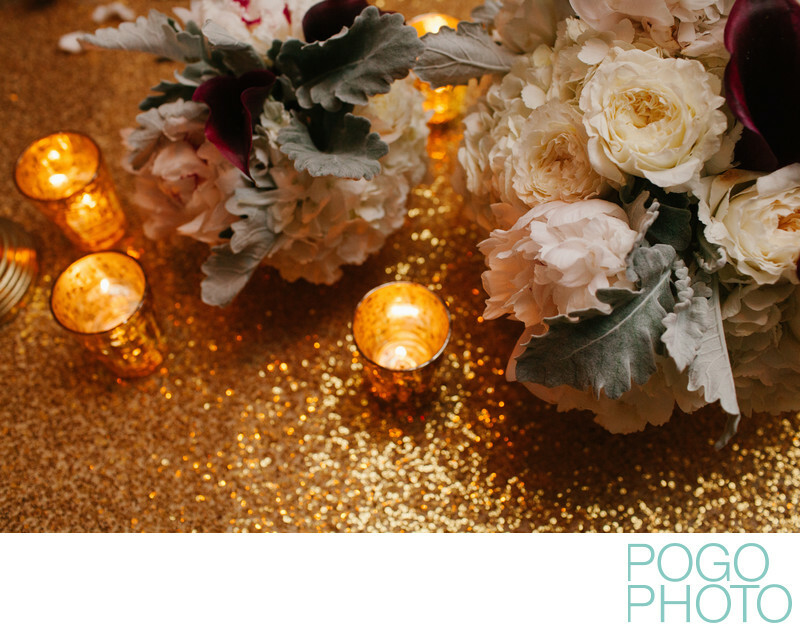 A sparkling table can be just that: literally sparkling, with gold sequined tablecloths, flickering candles in antiqued gold tea light candleholders, and soft, lush flower arrangements in casual clusters around the guest tables. This beautiful arrangement feels both opulent and modern, with the plush nature of the peonies and lambs ear giving the sharper gold accents a chance to mingle and come out as a strong balance between soft and sharp, garden and glitz. The glow from the tablecloths and candlelight creates a pleasingly flattering light on faces, making the wedding dinner feel both luxurious and romantic, and from a distance the sparkle reflected from the arrangements as a whole makes for a room that glitters. Photographing arrangements like this in order to capture the feel of the evening is a challenge we enjoy; we are careful to capture a full room shot if there is enough time within the wedding's schedule, but these up close details are typically better at conveying what it felt like to sit at a table and see the warm light cast from the candles, which adds to the overall coverage of the wedding day's story. Documentary photography can also cover details, and we find that it's part of our job as documentary wedding photographers in Vermont, Florida, and beyond to show the viewer more than just the events of the day; giving a sense of place can be shown through detail images. Location: Ocean Reef Club, 201 Ocean Reef Drive, Key Largo, Florida 33037.